On March 1st, the Registration will close for a few days so our intrepid Ticketing team can validate registrations and help folks who might have filled it out improperly. On March 4th, the big computer in the sky will shuffle names and ticket offers will be sent out to fine people everywhere. Afterward, anyone registered who hasn’t received a ticket offer will be put on a wait list, and Registration will open up again for anyone who missed the deadline. As people decline to purchase tickets or refund their tickets, the golden opportunity will pass to you, the beautiful and patient Wait Listers! This year, the vast majority of the ticket offers will be made immediately, which means that many more people will know if they have their tickets, and the wait list is likely to both be smaller and move slower. On the other hand, the surge to register for the lottery has been smaller, to date. All qualified Volunteer ticket offers and Theme Camp ticket offers must be redeemed by the time Registration closes March 1st. If you registered before then and you did not purchase a ticket, the offer will expire and you will face the random drawing with everyone else. There will be no exceptions. Theme camp leads that have been notified they can participate in the program will need to submit their names by February 26th. 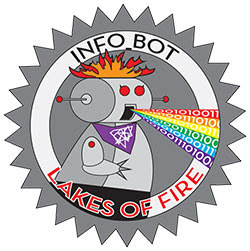 Lakes of Fire’s Low-Income Ticket (LIT) program is now accepting applications! We are offering reduced ticket prices for up to 70 attendees who meet the LIT criteria. You must receive a ticket offer in order to use a Low-Income Ticket discount. Fill out the Low-Income Ticket Request form by March 14th, 12:00AM EST. You will be contacted by March 20th about whether you are eligible for a Low-Income Ticket. You will either get a discount code or a partial refund, depending on whether you have already purchased a ticket. LIT price is 50% of a full price ticket. For more details, including restrictions, check out the Low-Income Ticket process in full. If you still have questions, please email lowincometickets@lakesoffire.org. The Volunteer application form is already open. You can find all of these forms on our Key Dates & Forms page!